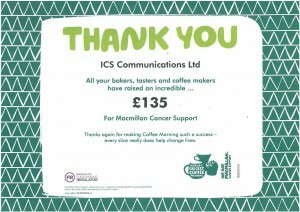 iCS has been sent their certificate for their fundraising (and eating) efforts at the recent Macmillan Coffee Morning. The team had great fun in putting their baking skills to best use for this very worthy and enjoyable coffee morning. The World’s Biggest Coffee Morning is Macmillan’s biggest fundraising event for people facing cancer. All over the UK, people host their own Coffee Mornings and donations on the day are made to Macmillan. The first ever Coffee Morning happened way back in 1990. It was a rather small affair with a simple idea: guests would gather over coffee and donate the cost of their cuppa to Macmillan in the process. It was very effective, it became a national event and iCS regularly take part. The iCS team all enjoyed the morning and are delighted to have raised the donation for this worthwhile charity.